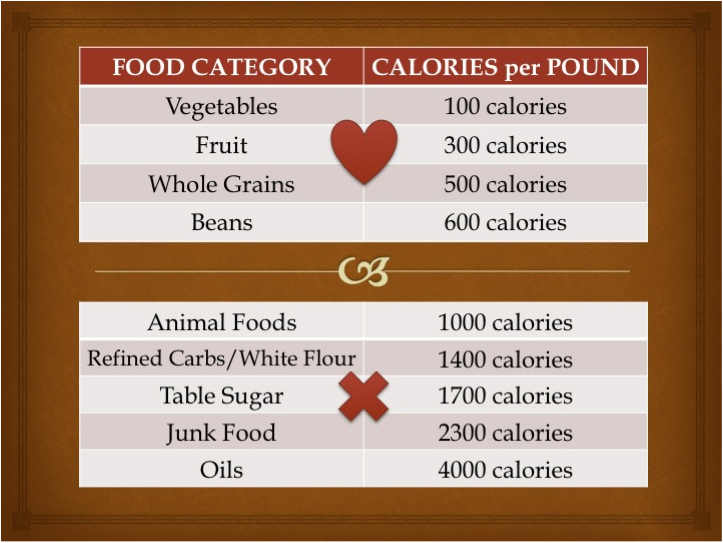 "Calorie density is the simplest approach to healthful eating and lifelong weight management. This common sense approach to sound nutrition allows for lifelong weight management without hunger; more food for fewer calories, and is easy to understand and follow. As such, I have put together the *Ultimate* resource guide of the best FREE information on calorie density on the internet." 10) The Secret To Successful Weight Loss: Calories, Fat or Calorie Density? Some other excellent resources on the principles of calorie density that are based on my work, from around the web for free. Here is an excellent graphic & review of my calorie density presentation at the first Plant-Stock in upstate NY back in August 2012 from "The Healthy Librarian​." "If You Stick to Primarily Eating the Foods Above the Red Line You'll Be Full, Healthy, & Not Overweight"
They made it into a refrigerator magnet and it is being used by several clinics around the country. 3) An Overview Chart from Judi Carreon who attended The March 2012 Group!! "All Jeff Novick's brain matter on one easy to reference page!" Thank you so much for your work. You are constantly arming us in the field with useful information to help our customers and clients. Here is a free Slide Show presentation on Calorie Density. Those familiar with my Calorie Density DVD will notice that this is very similar to and based on the one I have done for many years. "I’m a HUGE fan of yours!! I have all your wonderful DVDs and read your advice constantly (and share it with others). You are totally awesome, and I highly respect your expertise." There is a transcript below the slide show. It is good to see some many sharing this work for free. #3) Don't Drink Your Calories - Avoid liquid calories. Eat/chew your calories, don't drink or liquefy them. Liquids have little if any satiety so they do not fill you up as much as solid foods of equal calories. I am the one who created the calorie density overview chart you posted above. I made it to stick on my refrigerator after our March 2012, 10 Day. I posted it on our FaceBook group in April, 2013. So surprised to see it posted here and that you wanted to know who created it!! I gathered up all your Calorie Density info so that I could hang it on my refrigerator as a reminder and shared it with the group. Judi Carreon The March 2012 Group!! Last edited by Heyjudi on Mon Jun 29, 2015 9:44 am, edited 1 time in total. I am the one who created the calorie density overview chart you posted above. I made it to stick on my refrigerator after our March 2012, 10 Day. I shared it with our FaceBook group in April, 2013. So surprised to see it posted here and that you wanted to know who created it!! "Opps! There is an extra blank 2nd page but it looks like it came through okay. All Jeff Novick's brain matter on one easy to reference page!" Thanks so much for stopping by and helping me out. I saw the chart circulate on FB a while back and downloaded it at the time but when I went to post it, I could no longer find the post and who posted it. So, thanks for helping me out. I just want to give proper credit to the right person who put it together. It may be my work but you did a great job organizing it into one great overview chart and want to acknowledge that. Thanks again and see you on FB! PS I am also updating the above to give you credit. Thanks Jeff! I am honored to have my handy little chart featured in your resource list! Seriously honored! In the beginning it was so crucial to embrace and digest the information so that I could succeed on the McDougall Plan! I am still loving my life and health on the McD WOE! Your ability to translate the nutrition and science into laymen's terms is always so helpful! So thankful for your dedication to the sharing your knowledge! 2) Sequence Your Meals - Start your meals with a salad, soup and/or fruit. By starting with the foods that are lowest in calorie density, you begin to fill up for fewer calories. I love the Calorie Density resources. We need to continue to spread the message that the present day food pyramid presented to children today is maligned and is fostering bad health and poor eating habits! Thanks for the shout-out to the Garden Dish site and our Calorie Density posts Jeff! You rock. #4) Dilution is the Solution (the 50/50 guideline) - Dilute Out High Calorie Dense Foods/Meals - Dilute the calorie density of your meals by filling 1/2 your plate (by visual volume) with intact whole grains, starchy vegetables and/or legumes and the other half with non-starchy vegetables and/or fruit. This is really some fantastic info here. I think the whole grains CD needs little clarification. For e.g. one place it says 500 CD, the chart shows 1100. I assume 500 CD is for cooked food such as whole grain pasta or cooked brown rice and 1100 may be for whole wheat bread without any added fat etc. For a limited time, I am making the full DVD presentation, Calorie Density: How To Eat More, Weigh Less & Live Longer, available for free. This was a live webinar yesterday on Calorie Density by Matt Lederman. It is a presentation, I made together with him for the WFM Wellness Clubs. He does a great job and also discusses his 3-phase approach to calorie density, which he developed. In this free online presentation, New York Times bestselling author and board-certified internal medicine physician Matthew Lederman, MD, explains this simple but life-changing approach to losing weight and keeping it off. That’s not all though. Please join the webinar to find out more.